Shallow Tread provides even wear and reduces running temperatures for casing durability. Solid, rounded shoulder ribs increase rib stability to promote even wear. Premium casing and mold shape design are durable and highly retreadable. 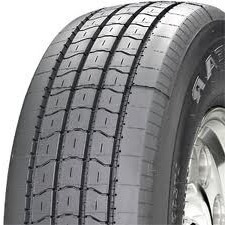 Rib edge sipes and lateral grooves deliver dependable traction.